Most lived on or near the town line between West Zorra and East Nissouri townships. They prepared boxes of “goodies” for service personnel from the community and shipped them overseas. 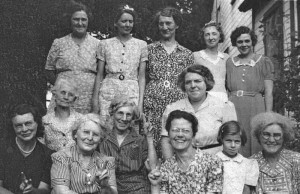 Front row, from left: Mrs. Benson Baker, Mrs. George Gates, Jane Kittmer, Mrs. James Baker, Darlene Morrison and Mrs. James Morrison. Middle row: Mrs. George Snell and Mrs. Adrian Ball. Back row, from left: Mrs. George McCorquodale, Mayme Snell, Eva McLeod, Lilla Snell and Mrs. George Noble.